Each team prepared dishes and presented them to be reviewed by a team of judges for the judges’ tally award, and also to be voted by students for The People’s Choice award. Don Sabola, Chef at Worcester Dining Commons, presents his team’s dishes to the judges. Judges from Wonderful Brands included Steve Diener, Juliana Sicairos, and Jim Feeney. Diener, Director of Food Service Sales, has been with Wonderful Brands for 10 years. “Wonderful Brands offer pomegranates, citrus fruits, mandarins, grapefruits, pistachios, and almonds” says Sicairos – Industrial Sales Coordinator. She was able to list the benefits of their products: pomegranates are high in antioxidants, pistachios and almonds contain healthy fats, and citrus contains healthy doses of Vitamin C. Diener added that all of their products are high in fiber. The event was well-attended by students. Marissa D, a sophomore majoring in Communication Disorders, walked all the way from Central Residential Complex, located across campus, to Hampshire Dining Commons because she loves the events so much. When asked which specials she had tried, Marissa responded with “I’ve already tried them all!” Her favorite dish was Team Worcester’s avocado California roll with pomegranate rice. Customers dining at Hampshire were able to vote for their favorite dish. The winner of this category received the People’s Choice Award. For the People’s Choice Award, 3rd Place went to Blue Wall with 63 points; 2nd Place went to Hampshire with 70 points; and 1st Place went to Franklin with 96 Points! People’s Choice Award Winner Team Franklin poses for a photo with the judges from Wonderful Brand, plus Garrett DiStefano and Ken Toong of UMass Auxiliary Services. After a tough deliberation, the judges made their decision. Diener stated, “We saw creativity we haven’t seen in years.” Without comparing notes, the judges’ tally results were as follows: a tie for 3rd Place between Catering and Berkshire with 99 Points; 2nd Place to Worcester with 102 Points, and 1st Place to Blue Wall with 104 Points. With a 2-point spread between first and second place, it was evident that the competition was tough and every team gave it their all. Judges’ Tally Winner Team Blue Wall poses for a photo with the judges from Wonderful Brands, plus Garrett DiStefano and Ken Toong of UMass Auxiliary Services. Judges’ Tally Winner Team Blue Wall’s plated entry. 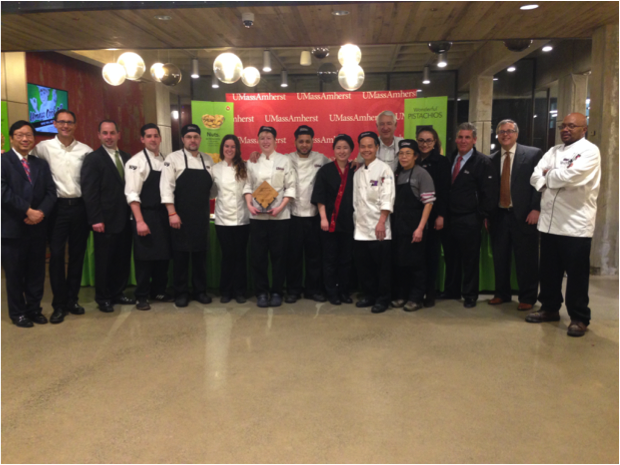 All of the teams showed incredible sportsmanship, and we look forward to hosting another successful UMass Cook-Off for years to come.